The Watertight Solution to Todays Roofing Demands! 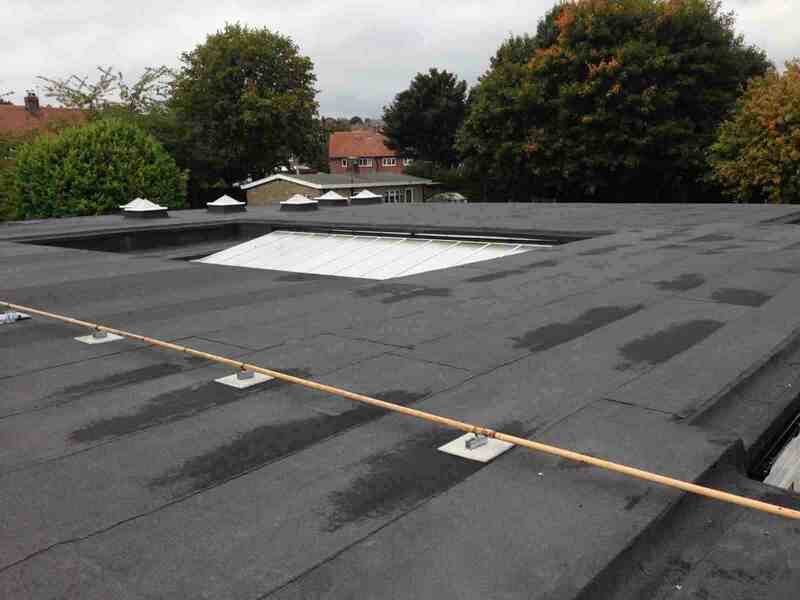 Flat Roofing: We provide a full refurbishment or repair service on existing buildings or provide completely new flat roof built up sytems on new build projects. All roofing works carried out are completed with the clients remit at the forefont of our best solution based approach. Whether it is a purely waterproofing exercise or the need to upgrade the roof to comply with current building regulations we will find the right product and specification to suit your requirements. We also carry out roofing projects based on manufacturer led specifications working closely with their Technical Field Managers to provide a 1st class result every time. Systems include the latest Flame Free applications, Single Layer Waterproofing Technology, and Traditional Torch on Systems. Slating & Tiling: Our roof tiling and slating services range from repairs to complete re-roofs, including work on listed buildings or conservation projects and new roof construction with concrete tiles, man made and natural slates including Welsh and Burlington. We also supply and fix all types of insulation products and breathable membranes, and a range of ancillary products including rainwater goods in aluminium, plastic, and steel. Liquid Waterproofing Applications: Where the requirement for a more flexible approach is needed in flat roof applications, we will put forward the latest in Polyurethane Coating Systems to enable the waterproofing of difficult roof areas that may have a lot of roof mounted plant or air conditionaing units. These products will still offer 10, 15, and 20 year gurantees and can be incorporated with fully insulated systems if required. The application of coating systems also lends itself to pitched corrugated roofs such as asbestos cement or metal cladded roofs. It has been particularly succesful in the rejuvenation of metal cladded walls on retail, factory, and warehouse units where the original plastisol or polyester coating has weathered or failed. This prolongs the life of the building and also refeshes the appearance as if it were new. Cladding Services: We offer a full cladding service including provision of new composite roofing systems, secret fix designs, and retro fit over cladding to existing roofs, and installation of new gutter liners. The inclusion of insulation quilt/wool or PIR/PUR composites is offered as part of the design criteria where required and replacement/upgrade to Step Safe (non fragile) roof lights. 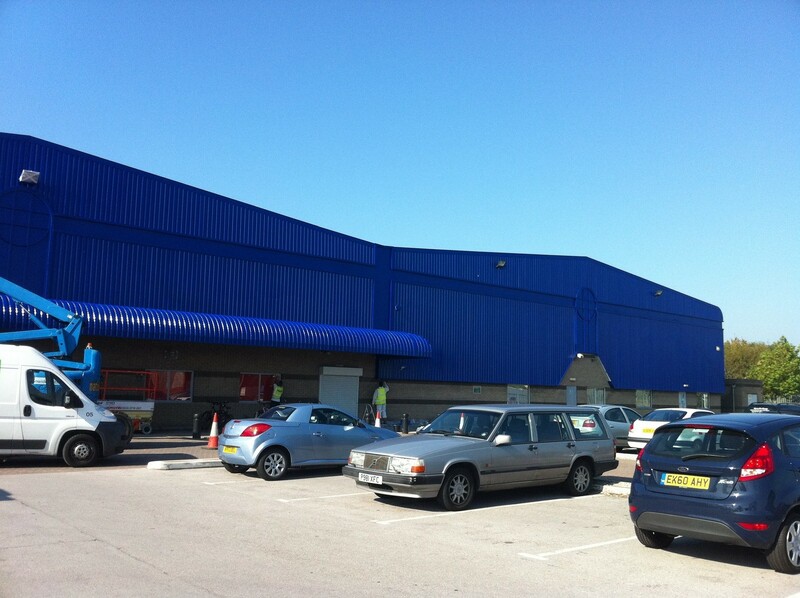 Also wall cladding, Trim-line guttering and rainwater goods, and general profiled roof maintenance including the removal of plant and vents and installation of roof security and integrity. 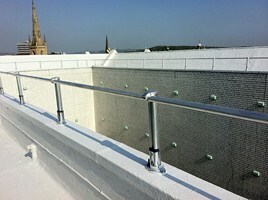 Man Anchor & Roof Safe Systems: With Health & Safety always at the core of all design and implementation of new or refurbished roofs, we offer a full and bespoke service to design, source, and fit roof safety systems including roof mounted guard rails to flat roofs including vertical access ladders. 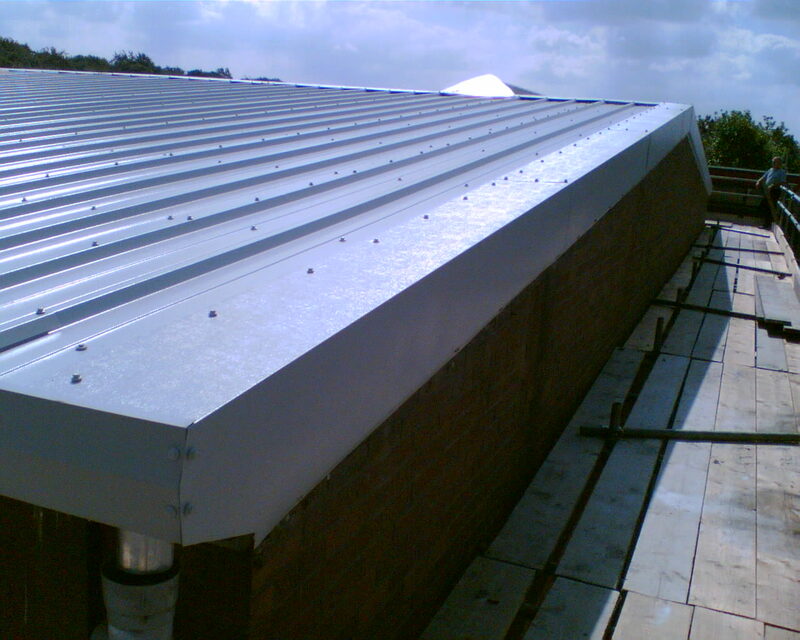 Man Anchor line systems fixed to metal pitched roofs with all appropriate PPE and safety equipment supplied. 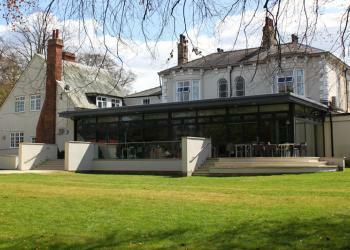 This is the recently completed refurbishment of the Youth Hostel Association branch at York. The roof to the new extension to the rear of the property was covered with Armourplan Single Ply roofing material with a lead effect detailing and a fully tapered insulation scheme. 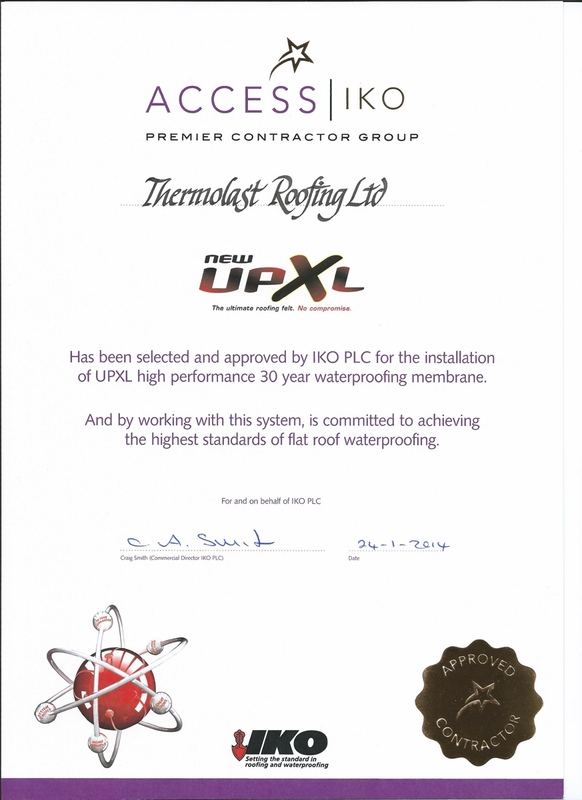 This was part of a large internal refit carried out by Wagstaff Interiors Ltd.
Thermolast Roofing Ltd have now been selected as part of the Access IKO Premier Contractor Group to install their new 30 year total system guarantee product UPXL. Access IKO Contractors are selected against strict criteria for standards of workmanship and professional integrity. Additional training is given by IKO and each installer is assessed individually to identify current levels of technical and practical experience. 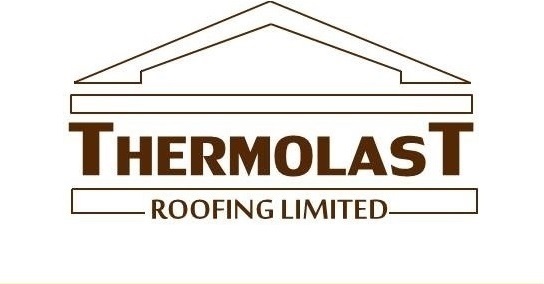 Thermolast Roofing have for a number of years been proud supporters of the Sheffield Childrens Hospital Charity. We have organised and run an annual Golf Day to raise money for specialist equipment to be used at the hospital, and have so far raised a staggering total of £90,000.